I pulled my phone out of my pocket to check the time during open gym last Friday. 10:45. How could we possibly still have 30 minutes left before we had to leave to pick up the twins from preschool? My three-year old and I had arrived to open gym later than usual (because we had to make a Target run, obviously) and to have 30 whole more minutes just didn’t seem possible. I looked at my phone again fifteen minutes later. Except it wasn’t fifteen minutes later. It had only been two. I looked at the clock on the wall, convinced my (*ahem* brand new) phone had stopped working, and resisted the urge to throw my (still new) phone to the floor. I resigned myself to twenty-eight more long minutes of chasing around my energetic boy. This was also the second Friday of the week. I mean, it obviously wasn’t, but it sure felt that way. I had been convinced all day on Wednesday that it was actually Friday. Every time I remembered it was really only Wednesday it felt like a fresh insult all over again. How dare you, Wednesday? Why did we still have two more entire days until it was Friday? You might ask what was up with last week. I’m asking myself the same thing. There were no blizzards, storms, or other inclement weather. No one was sick. Our car didn’t break down and the washing machine and dishwasher were both fully functioning. In fact, last week, it was pretty nice out. We played outside at a few different parks. The sun was shining. My preschoolers had only one day of school instead of their normal three, but that really didn’t seem to throw a wrench in our plans all that much. It was a pretty normal week. A week of being hard in all the ordinary ways. Read the rest over on the Twin Cities Moms Blog. I’m convinced March and August are the absolute worst months out of the year. The first is a month that sounds like it’s supposed to be spring. Can we all just agree that March, April, and May are spring months? (June, July, and August get summer, September, October, and November claim fall, while December, January, and February are clearly winter. This is basic science and logic.) Apparently Mother Nature is not on board, since she often sends blizzards of snow in late March just to remind us of where we all live. By that point, the snow isn’t magical anymore. It’s something to survive. We’re all sick of the sixth straight month of living in the same few square feet of space and the sibling fights become truly epic. And August. I just can’t with August. It’s too hot. I don’t like stepping outside and immediately sweating. All the summer activities have ended but the fall ones have yet to begin. It makes for a very long month. I’m over the whole sunscreen thing. I don’t want to wear shorts and tanktops. I’m also sick of coming up with no-cook meal ideas because who wants to cook when it’s 97 degrees outside? Nobody, that’s who. Now listen, lest you think I’m the grumpiest mom ever, let me tell you that I’m a great beginning-of-season parent.The first real days where it smells like summer or hints at the chill of winter? I am freaking fantastic. My mom game is on point in May and October. We kick off the first snowfall by drinking hot chocolate. With marshmallows. We watch Frozen as our landscape transforms, even if it’s only a little white dusting across the grass. I drink hot tea again. I break our day into a routine complete with designated snack, art, and quiet times. The fireplace is turned on, our warmest blankets are pulled out, and we are a hunker-down-in-this-house, hygge machine. Read more over on the Twin Cities Moms Blog. We’ve all heard it. Too many times, probably. Maybe as soon as we pushed those babies out of our bodies or welcomed them into our homes. They’re only little once. Enjoy it. You can clean the mess later. I think of the kids’ bathroom wedged between their bedrooms. How can I possibly clean this later? I can’t do it even after they’re all asleep. The sound of the toilet flushing would wake up the twins on the other side of one wall; running the water to scrub the bathtub would wake up the third on the other side of another. I look around the playroom after a joy-filled afternoon of play and sigh. The last thing I want to do is deal with this later. It’s a disaster. Absolutely worth it, since all three kids played together so well with everything from puzzles to their play kitchen. But still a complete and total watch-where-you-step-because-you-can’t-see-the-floor disaster. It’s not fair to expect me or my husband to clean this all up later when we didn’t make one iota of this mess. To excuse the kids from their part in this so we can “enjoy them now and clean up later” seems absolutely absurd. And exhausting. I walk through the kitchen and step on a stray Cheerio. Into the dining room and my stockinged feet crunch up a half-eaten cracker. I strip my socks off and toss them in the general direction of the laundry room only to walk in the living room to step directly on - most nightmarish of all - a LEGO. I really need to look down more. You’d think I’d have learned this by now, almost five years into being a stay-at-home parent. Most of my life these past five years has happened below me. My two-year-old has even been demanding it of me lately. “Mommy! Look a-me!” he says. Which means he wants me to squat down at his level, to look him in the eyes. Sometimes I sigh because it means I have to abandon the task at hand. Slicing an apple, stirring the pot of macaroni, wiping down the kitchen table. All things that I could continue to do while also listening to him talk. Things that also all take place below my eye level. There is a spot in my lower back, just to the right of my spine, that pinches in pain anytime I remained bent over too long. I know exactly where it is, can pinpoint its precise location, though it only acts up if I spend too long sitting on the floor to do puzzles or fold laundry without back support. (So...for a decent portion of my day.) It could be one of the ravages of aging, sure. I attribute it to parenting. All that work I do in the space 42 inches from the ground on down. I’ll feel the twinge in the middle of the night when my body, which was previously dozing comfortably beneath a pile of blankets, is woken by a call of, “Mommy I need you!” I blindly fumble my way down the hall to readjust someone else’s blankets, and as I bend over there it is, that shot of pain. Or when my son tells me to “look a-me”, and I bend over too fast, a motion my body apparently wasn’t ready for. I grab my back with my hand, a 30-something who maybe looks wizened before her time. 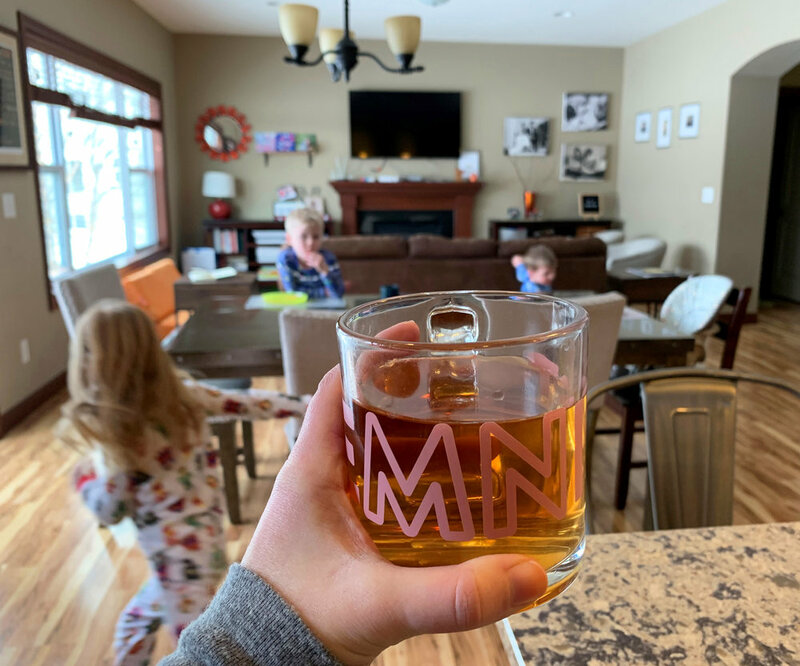 Read more about my aching back and all this life that’s happening below me over on the Twin Cities Moms Blog. I’m thirty-one years old and it really shouldn’t surprise me that it comes every day but here we are. Dark bedroom. Warm bed. Children who serve as the most functional alarm clock I’ve ever owned. I am decidedly not a morning person. So of course the other four people in my house are. My husband, while he’d rather not get wake-up calls quite as early as we do, still has the ability to roll over and get out of bed at the first sound of a child. Unlike me, who only has the ability to roll over into a more comfortable position. For the record, I’ve never had the ability to roll over and immediately get out of bed. Snooze buttons for the win, every time. My three kids, once they’re awake, are instantly awake. Like, ready-to-run-a-marathon awake. While I don’t even want to string a sentence together before I’ve had about twenty minutes to wash my face, change my clothes, and take those first few sips of coffee, they are ready to be up and out into the world. I have friends with kids of similar ages to mine who actually have to physically wake their children up in the morning. What in the actual world? This is as foreign to me as living in a place without snow on Christmas. Surely these children, these places, must be mythical. I hear that eventually, in the years of teens and preteens, this might become a thing in our house, too. But for now, they are awake. Always. Instantly. Whether the sun is shining or not, whether they’ve been up late the night before or not. Six o’clock hits and they. are. up. Read the rest over on the Twin Cities Moms Blog!